Concerned about YOUR local radiation levels? Want to see real time nuclear radiation readings while you're on the go? Get a copy of our FREE Radiation Map Tracker App for the iPad, iPhone, and iPod Touch! We also have versions available for both iOS and Android for just 99 cents. 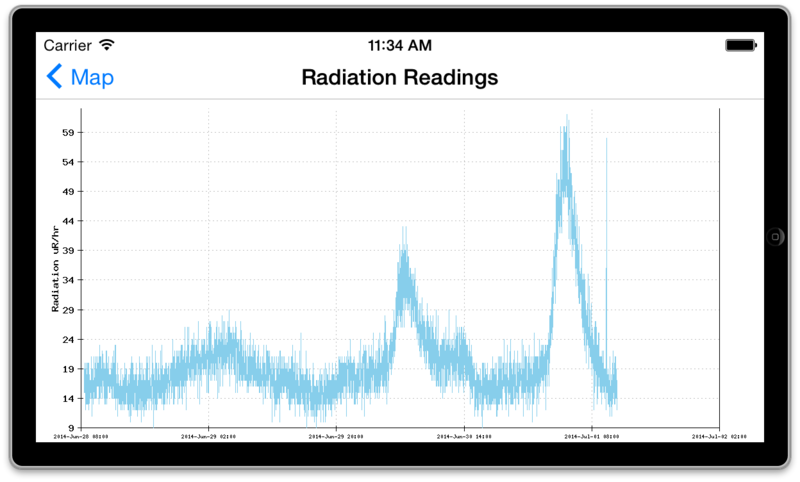 The iPhone/iPad version even lets you see graphs of radiation readings! Are your friends panicked by media coverage of the event? Share this page so they can see things are currently normal. You can scroll and zoom around the map. Note that these are generally run by individuals, and not all readings may be accurate. Do not panic because you see a high reading. Someone could be getting invalid readings. Only detectors with readings in the last 24 hours are displayed. Treat this for information purposes only, do not make safety decisions based upon it. Typical background radiation levels for most of the USA are in the 5 to 28 uR/hr range. Readings can be higher for brief periods of time due to normal variations in radiation levels. They can also be consistently higher for areas at high elevations such as Colorado, or with larger natural deposits of uranium, thorium, radon, etc. Please visit our Geiger Counter Product Page to get full details about our line of nuclear radiation detector products. The detector is connected to an ordinary computer (Windows or Macintosh) running a copy of the Rad software and connected to the internet (dialup, cable modem, dsl, etc). Rad automatically sends the current radiation reading to the web server that hosts this site, which generates the map showing the readings for all radiation monitoring stations. Rad is included free with any of our radiation detectors. A geiger counter lets you check the environment and items for radioactivity. You can use to check for the presence of radon on your house or basement, or even use it to go prospecting for uranium or other radioactive minerals. The GM-10 and other members of the geiger counter family can detect radioisotopes such as Polonium 210 which was used to poison Alexander Litvinenko. A geiger counter works by detecting the ionization produced by a radioactive particle. 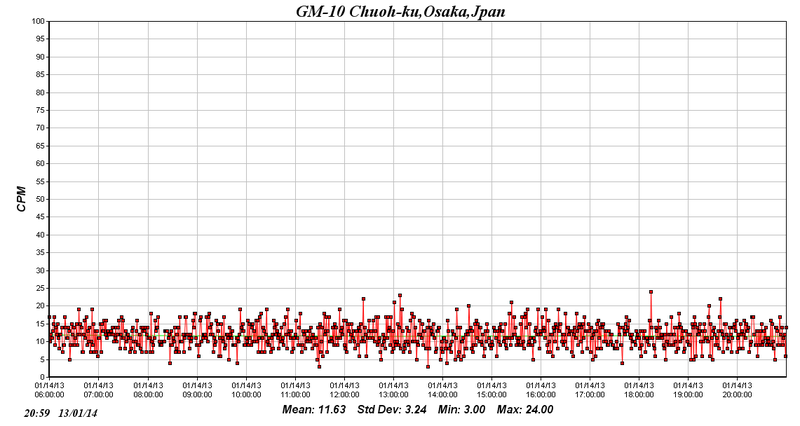 Each time a particle of radiation is detected, the counter records this event. The number of events recorded over a period of time indicates the amount of radiation present. Often this is done over one minute intervals, resulting in the familiar "counts per minute" or CPM. The higher the CPM, the higher the radiation levels. You can read a more in depth description of how geiger counters work. Radiation decay is a random event. That means that if the average reading is say 16 CPM, it will not remain a steady 16, but will bounce up and down. This is normal. The standard deviation is the square root of the average value, and the typical maximum range is plus or minus 3 standard deviations. So, using the above example, the square root of 16 is 4, so the standard deviation is 4. 3 times 4 is 12. So we would expect the readings to be 16 +/- 12, or range from 4 to 28. That is to say, even if the radiation levels are a "constant" 16, the apparent readings of the geiger counter will range between 4 and 28. So if you suddenly see the reading jump from 16 to 25, that does necessarily not mean that the radiation level has increased. There is a writeup about Counting Statistics available. Radioactivity is the emission of energy from the nucleus of certain nuclides or elements. Some naturally occuring radioactive elements include uranium and thorium and radon. A small amount of naturally occuring potassium is even radioactive. Alpha - the least penetrating form of radiation, can be stopped with a piece of paper or a few inches of air. Alpha rays are the nucleus of a helium atom, and are produced by certain radiactive materials such as thorium and uranium. Beta rays are more penetrating than alpha rays, and can be stopped by a few millimeters of aluminum or other metals. They are very fast moving electrons. Gamma rays are the most penetrating form of radiation. Depending on their energy, they can travel through up to several inches of steel, and hundreds of feet of air. They are usually produced in conjunction with either alpha or beta rays. You may be interested in Information on Radiation Units and Background Radiation Levels for more details about the various units of measurement for radiation, and some of the sources for naturally occuring radiation. We also have an interesting page about Radioactive Products and Other Sources Of Radiation. Many apparently harmless products are actually quite radioactive! With one of our a href="http://www.blackcatsystems.com/GM/">geiger counters you can inspect items that you own for radiation. Be sure to visit our home page, http://www.blackcatsystems.com We have a variety of software programs available for the Macintosh, Windows, iPhone, iPad, and iPod Touch. You'll be sure to find something of interest. Users of our detectors are welcome to add their site to the map. Contact us at info (at) blackcatsystems (dot) com for details on how. Today is: 2019-04-20, and the time is 18:46:07 UTC. This page will automatically refresh every 15 minutes. All data is Copyrighted (C)2002-2014 Black Cat Systems and may not be collected or displayed elsewhere without the express written permission of Black Cat Systems. We reserve the right to block access from sites or organizations that collect it without our permission, or modify the data sent to such sites or organizations.